The Williams approach to experiential learning is inclusive, academically rigorous, and holistic. We encourage and support the use of any of the experiential learning approaches in the college’s curriculum (problem-based learning (PBL), community-based learning (CBL), cooperative learning, etc,) as long as they are employed in academically rigorous ways. Williams’ homegrown version of experiential education, understood as “uncomfortable learning,” is also promoted by a specially selected faculty member, the Gaudino Scholar, with the support of the College’s Gaudino Fund. We also encourage students to think of their community service and other work experiences as informal learning opportunities which can help prepare them for curricular experiential learning. The following continuum provides a visual representation of these practices, arraying experiential opportunities involving no formal analysis at the left moving to those in which formal analysis is of primary importance on the right. Beyond specially designed courses, faculty welcome students developing their community service and work interests into curricular fieldwork, whether as a retooling of an existing assignment or an independent study. The list below highlights the major curricular and extracurricular venues for experiential learning at Williams. Opportunities to apply creative energy and initiative abound in government and non-profit organizations in the communities surrounding Williams. Students can help build homes with Habitat for Humanity, work on community energy efficiency campaigns, tutor in local schools, mentor at-risk youth, join or lead spring break service trips and more. Lehman Community Engagement facilitates student groups and projects. Students teach in local Pre-K-12 classrooms or guide students in specialized projects through the Local Education Outreach programs. For information on elementary school opportunities, contact Jennifer Swoap ([email protected]). For middle and high school opportunities, email Kaatje White ([email protected]). Students can apply for a grant from the ’68 Center for Career Exploration (CC) to intern over the summer with an organization or project anywhere in the world! To learn more, contact Dawn Dellea ([email protected]). Students can apply for funding for summer research and internship opportunities from the Center for Environmental Studies (CES), the Zilkha Center for Environmental Initiatives, the Economics Department. 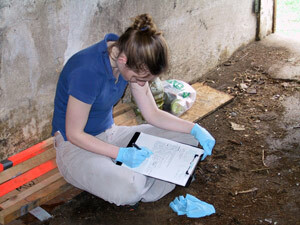 For environmental fieldwork support, visit the CES Student Opportunities page. For information on campus sustainability internship opportunities, go to the Zilkha Center Jobs & Internships page. For economics-related summer internship support, see the ECON Student Resources page. Students can work with Williams faculty on research projects involving fieldwork in the Humanities, Natural and Social Sciences through programs administered by the Office of the Dean of the Faculty. For more information, see the Funding section of the Faculty at Williams website. For funding for an independent research project, to the Office of Fellowships website to learn more. Students can take a Winter Study course such as Learning Intervention for Teens (PSCI/JLST 22) or Resettling Refugees in Maine (PHIL 26), or create their own experiential independent winter study project (WSP 99) under the guidance of a faculty sponsor. Contact Center for Learning in Action Director Paula Consolini ([email protected]) for more information. Choose from a wide range of semester-long courses involving experiential learning including Environmental Planning Workshop (ENVI 411), in which students work as consultants for governments and non-profits, Clinical and Community Psychology (PSYC 352), in which students apply their academic learning in social service and mental health agencies, and the Advanced Seminar in Teaching and Learning (PSYC 372), a teaching practicum course. Course listings are available on the CLiA Courses & Teaching page. Williams-Mystic and the Class of 1959 Teach NYC Urban Education Winter Study Program offer immersion learning in maritime studies and urban public school teaching, respectively.